The original Sin City (2005) was mostly an exercise in style and atmosphere, but oh, what an exercise it was! Under normal circumstances, this would be problematic since we naturally crave substance and characters to which we can attach ourselves, but because the film was so rich and glorious with its visuals, its presentation more than made up for the simplified narrative. 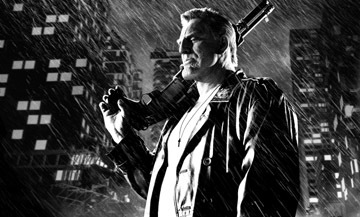 Now comes Sin City: A Dame to Kill For, and just like the first movie, it’s amazing to behold. Directors Robert Rodriguez and Frank Miller have once again crafted a stunning black-and-white world, full of sharp, pulsating contrasts, that’s about as close to a manifestation of Miller’s graphic novels as you can get. And, once again, the only primary colors are red, yellow and green, which underline the film’s brutal, prolific violence and make certain character traits, like hair, eyes and skin, jump off the screen. But, and here’s the catch, we’ve seen all this before. Because A Dame to Kill For is a sequel, Rodriguez and Miller are faced with the more difficult task of making a movie that doesn’t rely on its cosmetics to hold the audience’s interest. We can still be mesmerized by the images, and we are, but the individual stories and characters have to give us something more than just superficial narration. In other words, A Dame to Kill For needs to give us reasons to watch it instead of simply resorting to the same qualities that made the first “Sin City” so distinct. And there are reasons, but perhaps not enough. Each of the film’s three stories stands on its own and is interesting and energetic in its own right, and the actors and actresses who fulfill the archetypal film noir roles are easily up to the task of engaging us with their presence and body language, but there’s just something about the film as a whole that makes us feel like we’ve already been down this road. Watching it is like going on a rollercoaster you’ve ridden before: it gives you pleasure and a rush for the simple fact it’s a rollercoaster, but because you already know where the first drop and flip are going to be, it’s ultimately less special. Going into A Dame to Kill For, we don’t know exactly when or how everything is going to happen, but after a while, we can guess and we’re mostly right.